It is the first of November 2015. The air is cool in Citi Field but the atmosphere is electric. 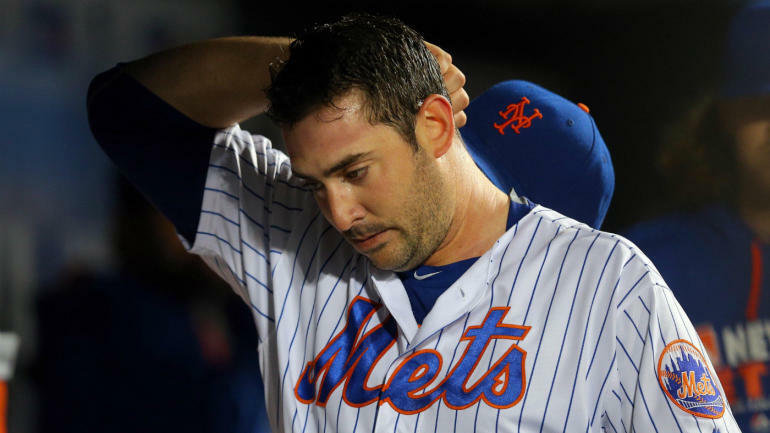 With New York trailing in the series 3-1, Mets ace Matt Harvey is dominating the Royals. The Mets are staked to a 2-0. Through seven innings, Harvey is dominating. “HARVEY! HARVEY! HARVEY!” roars the crowd. The 26 year old stud has thrown 94 pitches. Mets manager Terry Collins decides to leave Harvey in for the eighth. He breezes through the Royals batters and the crowd of 44,859 yells in unison “HARVEY! HARVEY! HARVEY!” Collins looks like he will stick with his game plan. He lets the young star know that his night has come to an end and Familia will come in. After a brief conversation and with fire in his eyes, Harvey convinces the veteran skipper to keep him in for the ninth. We all know what happened after this. A walk and a double later, Harvey is pulled. Hosmer stole a run to tie the game and the Mets lost in twelve. Little did we know but that was the last time the Dark Knight would walk off the mound in Gotham. The Harvey saga started out really well. After a disastrous 2009 season, the Mets had the seventh overall pick in the 2010 draft. GM Omar Minaya took 21 year old Matt Harvey. He sailed through the minors and by 2012, the top prospect was pitching in Queens. Despite a 3-5 record, Harvey showed signs of brilliance. He had an ERA of 2.73, a WHIP of 1.146 and struck out more than a batter per inning on average. Harvey was the best rookie pitcher the Mets had since Dwight Gooden in 1984. In May 2013, Matt Harvey found himself on the cover of Sports Illustrated with the title “The Dark Knight of Gotham.” It was a persona that he embraced. While the 2013 Mets went nowhere, Harvey was clearly going places. In July, he was the starter of the NL All Star Team and the word was out. Matt Harvey was the real deal. His already impressive numbers had gotten better. He had an ERA of 2.27, a WHIP of 0.931 and let the majors with a FIP of 2.01. However, by late August his year ended abruptly. Harvey was diagnosed with a tear in his UCL. He’d need Tommy John and would miss all of 2014. It was a blow that everyone knew would set the organization back by a year. David Wright and Matt Harvey at the 2013 All Star Game. Both of their careers have been decimated by rare injuries. Harvey returned in 2015 right where he left off. The ace dominated all year long and the Mets took the NL East. Harvey picked up victories in both the division series and NLCS. He pitched well in game one of the World Series but ended up with a no decision. Game 5 turned out to be the pinnacle of Harvey’s career. When the Mets began 2016, they were in ‘win-now’ mode. With a hand of aces the sky was the limit. As the season began, something seemed off about our beloved Dark Knight. His velocity was down, batters were able to pound him and he seemed tired as the game went on. No one could quite figure out what was wrong despite a plethora of theories. The bottom line is that he simply wasn’t a good pitcher. In June Harvey was diagnosed with thoracic outlet syndrome. This rare condition required the removal of a rib to cure… or so we thought. In 2017, the struggles continued. When the Mets hired Mickey Callaway before the 2018 season, the hope was that the pitching guru from Cleveland would be able to fix the shattered star. That didn’t happen. If anything the ace pilot just sputtered out of control. After a failed attempt to make Harvey a relief pitcher, the Mets designated him for assignment. The big question is how The Dark Knight devolved into Hurricane Harvey? How does a guy with so much talent simply lose it? Many claim that the reason is that Harvey stopped caring about baseball the way he once did. The good-looking stud was seen around the Big Apple with no shortage of gorgeous women. Harvey was seen at Knicks and Rangers games. This wouldn’t be an issue but he was also known to have a good night out on the town. Many have speculated that this party animal life style simply got the best of him. This was reminiscent of Doc and Darryl. Harvey always seemed to end up on the wrong page of the NY Post. Whether he ‘overslept’ a practice before the 2015 playoffs or missed a game in 2017, Harvey had a tendency to not be fully focused on the team. Was this the cause of the demise? Not likely. There have been no shortage of players who have been known to have a good time while playing for the Mets. In 1986, the Mets won 108 regular season games and then a World Series with a team that was as high as a kite. Let’s not kid ourselves into thinking that Harvey is unique in his love for partying. While missing a practice and a game (that he wasn’t starting) are bad, it isn’t a huge deal when you look at the bigger picture. The main problem is that it made Harvey an unsympathetic character. By the end Harvey went from hero to villain. He made it clear that he didn’t want to be in the bullpen. When the Mets wanted him to go to the minors to straighten himself out, he refused. I doubt anyone honestly thinks that the Mets front office made a mistake by getting rid of the onetime ace. Harvey has been hurting the team for too long now. Most importantly, Harvey never could come to terms with the idea of being anything but a flamethrower. He needed to learn how to become a crafty pitcher like Colon and Pedro later in their careers. Instead, Harvey has turned into a minor leaguer. Mets fans have every right to feel traumatized. Harvey came onto the scene in 2012 as a savior. He was the first of the five aces to reach the big leagues. When Harvey entered the majors, Thor was a Blue Jay. Jacob deGrom was recovering from Tommy John and playing A+ ball. Zack Wheeler was close to the majors but Matz was in rookie ball. In other words, he was our first love. The Mets hadn’t seen a rookie like the Dark Knight since Doc in 1984. The day he pitched was Harvey Day. Letting go of all of this is a tough pill to swallow… but it is the right move. The 5 aces are no longer together… and it hurts. Time will tell how this will play out. Alderson will try to trade Harvey for someone, but likely won’t get much. The worst case scenario for the Mets is that some team has already figured out what Harvey is doing wrong and can correct him. He will turn back into an All Star. Even worse would be if the Yankees are that team. This would torment the Mets for years to come. With that said we need to face reality. Matt Harvey had no future on the mound of Citi Field. It is clear that he can only improve now that he is no longer a Met. This is a tragic story but the reality is that the Mets had no other choice.